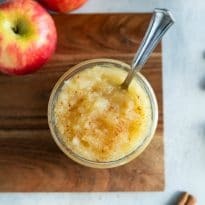 A classic, homemade applesauce recipe is super easy to make and can last for a long time by freezing or canning. This version is flavored with a touch of sugar, but added ingredients such as cinnamon, cranberries, or ginger add a super rich bite that can’t compare to any store bought variety. Add it as a side to your next pork dinner or simply serve it to the kids as a healthy, afternoon snack! In a large Dutch oven or stock pot, combine apples, water, sugar, and salt. Cover and cook over medium-low, stirring occasionally, until the apples begin to soften and break down, 15 to 20 minutes. Mash the apples against the side of the pot with a wooden spoon or against the bottom of the pot with a potato masher. Adjust sweetness and texture with additional sugar or water as desired. My favorite apples for applesauce are Jonagold, Pink Lady, Jonathan, and Macoun. To double the recipe, increase the cooking time by 10 to 15 minutes. To make the applesauce ahead, cover and refrigerate in an airtight container for up to 10 days. To make cinnamon applesauce, add 1/4 teaspoon ground cinnamon OR two 3-inch cinnamon sticks to the apples. Remove before mashing. To make cranberry applesauce, add 1 cup fresh or frozen cranberries with apples. To make ginger applesauce, add three 1/2-inch smashed ginger slices with apples. Remove before mashing.